Oh look, another Kasie West book read in one sitting! These books are so incredibly addictive in their cute, swoony fluffiness and The Fill-In Boyfriend was no exception. Though I must say, this was a little harder to read than the other Kasie West books I’ve read. And that is mainly because the main character Gia is such an unlikeable character in the beginning and her antics were selfish, naive and even downright childish. I felt old reading this, because I just wanted to smack her and tell her to grow up plenty of times. Same with her bitchy, gossipy, judgmental friends. However, don’t let that stop you. Because even though Gia starts this story as a super annoying, self-centered teen, the character development she goes through is pretty great. It’s nice watching her go on this journey of self-discovery and to see her at least try to be a better person each day. The premise of this story is a pretty big and predictable romance trope, but honestly I can’t get enough of the ‘pretending to date to make someone jealous but then actually falling love’ trope. It feels like one of those nineties high-school rom-coms and I LOVE IT. It also helps that I absolutely loved the fill-in boyfriend. He reminded me of Clark from Morgan Matson’s The Unexpected Everything, whom I also loved. So hey, I guess that’s just my fictional boyfriend type. But I didn’t just love him, I also loved the whole progress of his relationship with Gia. I especially loved what he brought out in her and the other way around. They helped eachother deal with their respective issues and I really appreciated this. The secondary characters in this are pretty much hit-or-miss. Like I said, I couldn’t stand Gia’s so-called “friends”. And Gia’s mother, father and brother were all pretty unlikeable too. They each had their issues, which in turn affected Gia and turned her into the person she was. But all those unlikeable characters are balanced out pretty nicely by the amazing new people Gia meets on her journey, like the aforementioned swoony fill-in boyfriend, his angry but amazing sister Bec, their artsy, hippie mother and even smaller characters such as Nate, Marcus and Blake. So even though this bok had its’ flaws, I still love it because of the character development and because I am trash for this kind of trope. Cute, fluffy, adorable, the perfect book if you’re in a high-school nineties rom-com mood. 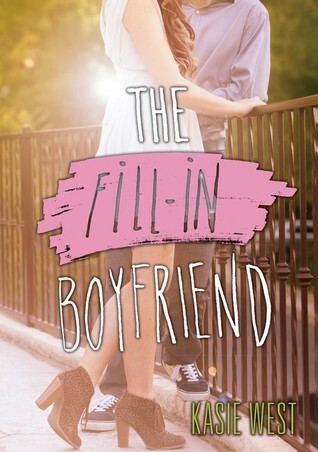 Have you read The Fill-In Boyfriend? What did you think about it? This book sounds so great : ) I’m glad you enjoyed it. One seating reads are amazing. I especially am excited for the “cute, swoony fluffiness” – who doesn’t want some of that in their books every now and then! Next time I need a cute, swoony read I’ll keep an eye out for this one! I’ve been meaning to read a Kasie West book one of these days. I’ve heard a lot of good things about them. The Fill-In Boyfriend’s premise caught my eye and I’ve been thinking about getting it. I love the “pretending to date to make someone jealous but then actually falling love:” trope too. Glad to know that you loved it.